More people have been forced out of their homes nearly a week after Hurricane Harvey, as heavy rain hit Louisiana and knocked out the entire drinking water system in a Texas city of almost 120,000 people. 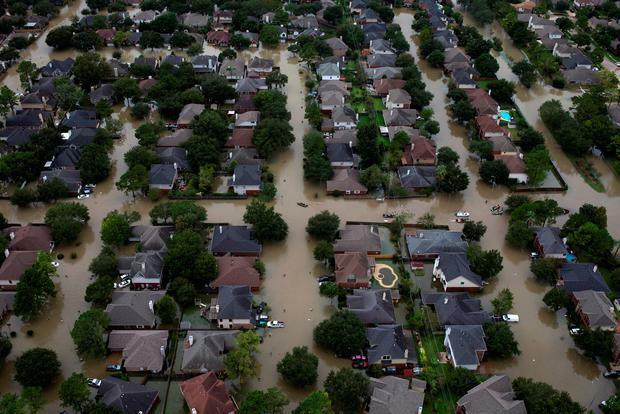 Meanwhile, the mayor of Houston pleaded for more high-water vehicles and more search-and-rescue equipment as the US's fourth-largest city continued looking for any survivors or bodies that might have somehow escaped notice in flood-ravaged neighbourhoods. Sylvester Turner also asked the Federal Emergency Management Agency (FEMA) to provide more workers to process applications from thousands of people seeking government help. Harvey victims expect the FEMA to work "with the greatest degree of urgency", Mr Turner said. The mayor said he will request a preliminary financial aid package of 75 million dollars (£58 million) for debris removal alone. The remnants of the storm were dying as they pushed deeper inland but remained powerful enough to raise the risk of flooding as far north as Kentucky. More than 1,500 people were staying at shelters in Louisiana and that number was climbing as more people evacuate from flood-ravaged communities in Texas. The state opened a seventh shelter on Friday in Shreveport for up to 2,400 people, said Shauna Sanford, a spokeswoman for Louisiana governor John Bel Edwards. The city of Beaumont, near the Texas-Louisiana line, was evacuating and trying to bring in enough bottled water for people who stayed behind after a water pumping station was overwhelmed by the swollen Neches River. 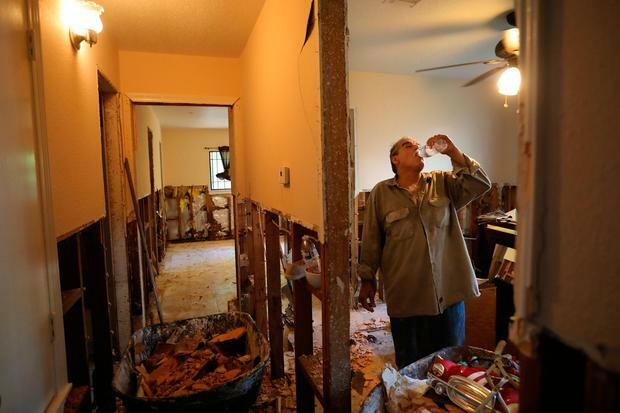 In Houston, officials turned their attention to immediate needs such as finding temporary housing for those in shelters, but also to the city's long-term recovery, which will take years and billions of dollars. 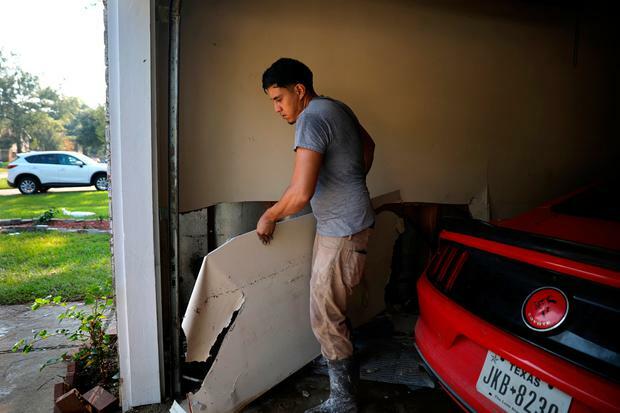 Authorities raised the death toll from the storm to 39 late on Thursday, while rescue workers conducted a street-by-street search of tens of thousands of Houston homes that rescuers began on Thursday. The latest statewide damage surveys revealed the staggering extent of the destruction. 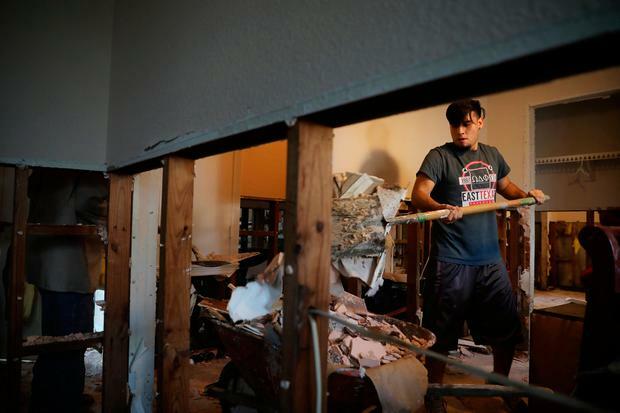 An estimated 136,000 structures in Harris County, or 10% of all structures in the county database, were flooded, according to the flood control district for the county, which includes Houston. Jeff Lindner, a meteorologist for the agency, called that a conservative estimate. It is 36,000 more homes than were flooded by Tropical Storm Allison in 1989, the area's previous epic flood. About 325,000 people have already sought federal emergency aid in the wake of Harvey. More than 57 million dollars (£44 million) in individual assistance has already been paid out, FEMA officials said. Houston fire chief Sam Pena said his department had responded to nearly 16,000 calls since the storm hit on Saturday, more than 7,600 of them for water rescues. The search for more survivors and bodies began on Thursday when more than 200 firefighters, police officers and members of an urban search-and-rescue team fanned out across the Meyerland neighbourhood. "We don't think we're going to find any humans, but we're prepared if we do," said district chief James Pennington, of the Houston Fire Department. Unlike during Hurricane Katrina's aftermath in New Orleans, crews used GPS devices to log the homes they checked rather than painting neon Xs on the outside. That avoided alerting potential thieves to vacant homes. Governor Greg Abbott warned it could take years for Texas to "dig out from this catastrophe". President Donald Trump tweeted that there is still "so much to do" in Texas's recovery. 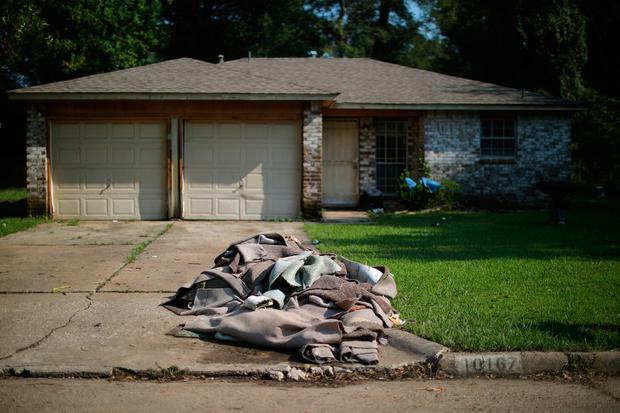 Harris County FEMA director Tom Fargione said the agency was looking for ways to house people who lost their homes to Harvey, with 32,000 people reported in shelters across Texas. Some evacuees have begun returning to their homes but the George R Brown Convention Centre, where 10,000 people took shelter, still housed 8,000 evacuees late on Thursday. The priority is to get those who are not able to return to their homes into some form of temporary housing, Mr Fargione said. Authorities were also monitoring a flood-crippled chemical plant near Houston, where the loss of power set off explosions and a fire on Thursday. The blasts at the Arkema plant north-east of Houston sent up a plume of acrid black smoke that stung the eyes and lungs. The plant's owners warned more explosions could follow because a loss of refrigeration was causing chemicals stored there to degrade and burn. 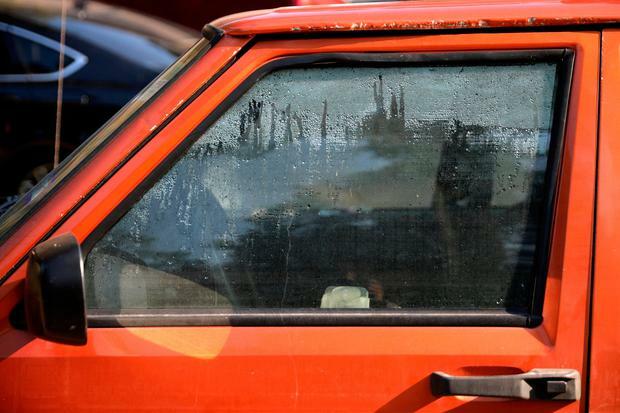 With widespread reports of fuel shortages, the head of the Texas agency that regulates the oil and gas industry urged drivers to wait three or four days to fill up their tanks. Panic buying is causing a run on fuel and empty fuel pumps, Texas Railroad Commissioner Ryan Sitton said. Energy secretary Rick Perry said he would release 500,000 barrels of crude oil from an emergency stockpile in a bid to prevent petrol prices from spiking. Harvey initially came ashore as a Category 4 hurricane in Texas on August 25, then went back out to sea and lingered off the coast as a tropical storm for days, inundating flood-prone Houston. The storm brought five straight days of rain totalling close to 52in, the heaviest tropical downpour ever recorded in the continental US.